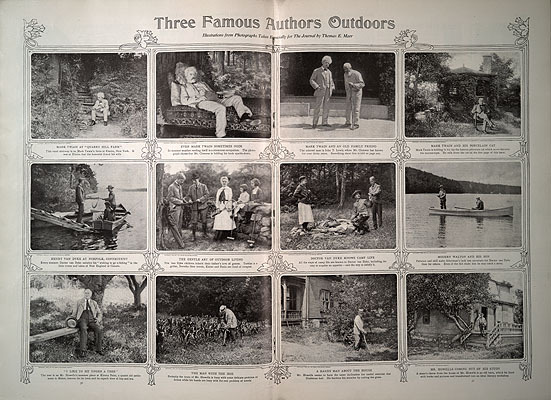 [In the summer of 1903 Edward Bok, editor of The Ladies Home Journal, decided to send photographer Thomas E. Marr to take pictures of Three Famous Authors at their summer homes. MT, at his in-laws' Quarry Farm in Elmira, New York, was one. The other two -- Henry Van Dyke (in Connecticut) and William Dean Howells (in Maine) -- are a lot less famous now than they were at the time. Van Dyke was a popular poet and essayist whose rhyming tribute to MT can be found in the section on MT'S SEVENTIETH BIRTHDAY. Howells was an editor and novelist who appears often in this archive as one of MT's best friends and supporters. In an 8 July 1903 letter to Bok, MT expressed his willingness to pose for the pictures, if Bok would come to him on the mountain. Right after Marr's visit, on 17 July, MT sent Bok another letter, enclosing captions for the two pictures on the right below, of himself with John T. Lewis and himself with a porcelain cat . In the caption MT writes that Lewis, an African American servant of the Crane family, had been a slave, but the next day wrote Bok another letter to say he was wrong about that, and to ask Bok to send proofs of his comments so "Mrs. Clemens can edit them." Bok did send him the proof sheet, which is also in Barrett Collection with the revision MT requested and his "OK" to the final text. The magazine published the note on the first page of the November issue, in which the photos of all three authors appeared (below). Click on any photograph to enlarge it.